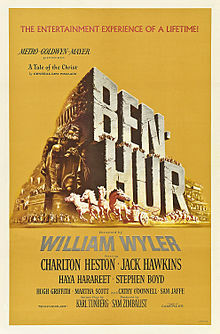 Ben-Hur is a 1959 American epic releegious drama film, directit bi William Wyler, produced bi Sam Zimbalist for Metro-Goldwyn-Mayer an starnin Charlton Heston as the teetle chairacter. ↑ Awtho Tunberg received sole credit for the screenplay, Maxwell Anderson, S. N. Behrman, Gore Vidal an Christopher Fry wirkit on the script in the coorse o development. This page wis last eeditit on 2 Mey 2018, at 07:02.